Bedecked in a heavy wedding lehnga, she flits across a room blazing with lights and flowers. Older relatives bless her as she touches their feet on her way to the adjoining hallway. Her face clouds as she stops to hug a garlanded portrait of her late father. The exuberant shehnai of the approaching baraat interrupts her thoughts. She puts the photo down and a smile breaks through as she runs upstairs. “Mom, it’s time,” she says, opening the door to reveal the older woman, resplendent in her bridal attire. The daughter escorts the mother to the mandap in a striking role reversal. The scene is from an ad for a contemporary Indian woman’s magazine which was made some years ago to highlight changing family relationships — and now, it needs updating. Second marriages are no longer confined to men and women of a certain age. Rather, a growing number of 30-somethings are tying, untying and re-tying the knot, as if they were in a matrimonial merry-go-round. “None of my friends would dream of staying 15 years in a bad marriage today,” says Nishi, 33, whose own parents lived together in a dead and debilitating one for decades. “Life is short. You cut your losses and move on,” she says. “It is a process, not a trauma, and nearly all my friends who’ve split up are in other relationships.” Nishi herself barely stayed a year before walking out on a schizophrenic husband. Today, she’s expecting a child and contemplating marrying again while waiting for her divorce to be finalised. Are second marriages a ‘triumph of hope over experience’ as the British culture critic and writer Samuel Johnson once said? Or is that too cynical given the large number of second-timers who are casting about for a suitable boy or girl? The internet ensures geography is no longer a physical constraint on dating possibilities and a virtual ecosystem of eligible singles can delight the senses of searchers. Dating apps, social media, matrimonial websites — today’s singles have multiple avenues to explore. Wedding bells chimed for the NRI from Canada and the girl from Kolkata who met on secondshaadi.com. Pappu from Punjab met ‘second wifeji’ from Panipat on re-marriage.com. There’s mysecondmarriage.com, bandhan.com/female/remarriage and a dozen other sites thriving on the aspirations of the matrimonially wounded that believe ‘things are better the second time round’. Secondshaadi.com has some two lakh odd members who believe so. In fact, India’s leading remarriage portals claim to have 5,000 to 10,000 new registrations every month thanks, in part, to soaring divorce rates among the 28 to 32 age group. Bharat Matrimony had some 45,000 divorcees on its portal in 2010 and half of them came from tier-two cities, indicating a widespread social change. Not all unions flourish however, and the NRI from Canada broke his after pictures of his fiancée in a lingerie shoot surfaced after their shaadi. On the other hand, social media provided a lifeline to a girl from Chandigarh whose husband beat her up and locked her in their New York apartment. Barely was he out the door, when she posted a selfie of her battered face on Facebook alerting her sister on another continent to call the police. Movie stars and celebrities have their fair share of second attempts too and it doesn’t hurt their careers, some even thrive on the publicity. What’s changed is the public attitude towards the second spouse. “Earlier, second wives were called home-breakers and the child would always side with their mother, the first wife” says Sejal, a wedding planner. “But now attitudes have changed. There is acceptance that couples outgrow each other, fail to make adjustments or just prefer to be single.” Sejal handles a number of second weddings where the couple usually forgo the mehndi, sangeet, doli for a single reception which they host themselves for their own friends. For Mallika, a Delhi media professional in her ’60s, Reva’s observations are too close to home. She belongs to the first generation of working women post-Independence who faced lots of pressures to fulfil both the traditional housewife role and that of a breadwinner. Her first marriage collapsed when her growing success bred insecurity in her spouse; his contribution to their life together and child-rearing was inadequate. To hear that two generations later, many Indian men behave like their fathers, even when they have been raised by working women, is a shock. So what do young girls do? “Many of my girlfriends use dating apps like Tinder which let them decide whom they want to meet in their neighbourhood.” Reva mentions a friend, who met her American husband in Bandra on Tinder. “In her case, the family broke up the first marriage. The couple was living in a nuclear household but the expectations were that of a joint family.” Tinder claims it has 50 million active users who check their accounts 11 times a day, leading to some 11 billion connections in the world of cyber dating. India’s millennials, like their counterparts elsewhere, are a more self-focused generation concerned with what they are getting out of life. A marriage lasts only as long as it works for both partners. The relationship is transactional and ideas of adjusting and supporting each other exist only to a point. Commitment is an old-fashioned word with a short shelf life in an era where obsolescence is deliberately built into the environment; the thinking being that if you stay in the same place physically and mentally, you’ll get left behind. Salma, a divorcee and single mother of twins, recalls a session with a court-appointed Mumbai relationship counsellor who “told me relocation was the leading cause among young couples these days”. To many of an older generation, it seems almost irresponsibly frivolous to wreck a marriage because of a reluctance to relocate, but for today’s couples it’s a good enough reason. While violence of any type is taboo, many unions die for less dramatic reasons — of which the most common is boredom. “Chances are you’ve been dating the guy for years and you know him very well. You think there are no surprises…and that becomes the problem. It’s just the same old, same old…couples get busy in their own careers and have their own girls’ and guys’ nights out, and before you know it, the distance becomes too big,” says Nita, a Mumbai-based therapist. 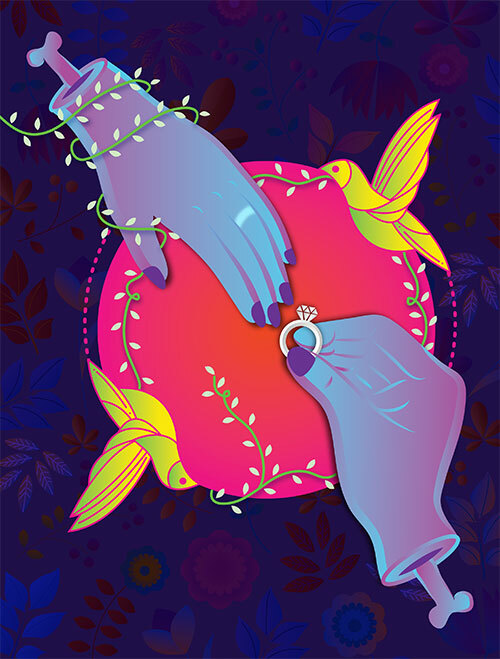 Among Mallika’s group of older friends, second marriages work for a number of reasons. “Many of the wives agree to give the husband’s assets and income to the first wife and kids because they are usually independent working women themselves. They foster an open relationship with their stepchildren and over time, respect grows.” As in the case of Shabana Azmi. Even Camilla Parker Bowles found grace when she married Prince Charles — a second union for both. For those who doubt the wisdom of remarrying, perhaps the glowing testimonials on websites like secondshaadi.com will provide reassurance. As will the growing number of young Indians on websites and dating apps who hope every day will bring them closer to a match that will realise the unfulfilled dreams of their pehla pehla pyaar.